This rug is thinner than most jute rugs making is soft and comfortable for living rooms and bedrooms. It is well made and of high quality. Give your home a touch of natural elegance and artisan craftsmanship with this natural fiber braided reversible jute rug. Hand spun and braided from sturdy jute fibers, the rug offers lasting durability and style. The natural color and Southwestern inspired design enhance any decor. Look, I'm a 32-year-old adult. I've never owned a rug, and I have commitment issues. So I spent way too much time looking at rugs on many sites and at outlet stores because I'm not wealthy. My friends kept telling me "rugs are an investment" and said that I shouldn't spend less than $400 because it would probably be crap. LIES. THEY'RE ALL LIARS. This rug is FINE, dudes. It's softer than I expected. It grounds the room and if one of my dumb liar friends spills a glass of wine on it, well, at least I didn't spend $400 on it, AMIRITE? Anyway, yes this is a good rug, just get it. I purchased the Eco Natural Fiber Braided Round Jute Rug and placed it under my dinet set. I just love it. I do like this rug. It is not particularly thick, but it's not too thin either, and is what I expected. It works well under my kitchen nook table. I don't need a pad underneath it. It is soft and comfortable on bare feet. It laid down flat immediately out of the package. My only disappointment is with the color. It appeared paler and more wheat colored on my screen, which is what I hoped for. The real color is a bit darker,richer, and more golden: more like honey. It's hard to imagine returning this rug, as it is big and heavy, so I will use it until I find one in the right color, and then move this one to a different area in my home. The color and description of the rug were very accurately described. The coloring of the rug looks just like the picture. Very pleased. So far I think the quality is very good and I am using it in a high traffic area. I purchased this rug to go underneath my kitchen table on hardwood floors. It's a very soft woven jute. The weave is made of vertical rows of tightly braided jute, so while it's soft and natural, it doesn't look sloppy like some jute rugs. there is no latex backing so a rug pad must be used under it or it will slide everywhere. (I bought a rug pad that works really well with it; it's rubber on the floor side and thick felt on the side that faces the jute rug.) This rug has beautiful shades that resemble driftwood. I would say it's a cool neutral rather than a warm neutral. I also like that it's reversible - we'll see how well it holds up over time. I have a 42" round pub set with 4 22" deep chairs. At first I thought I needed a 7' rug but this 6' rug is perfect. It is large enough for the chairs to still be on it when pulled out to use. I looked at literally thousands of rugs online and searched every store I could find for a round rug. We have contemporary furnishings and I didn't want the oriental rug look. This rug is perfect! The colors are warm enough that it has character and is not bland at all but it blends with the furniture. The picture is very true to the colors. It is warm brown with flecks of gold and a bit of chocolate here and there. It is thicker than I thought it would be. I figured we would have to give it time to lay flat, no way, this baby practically hugged itself to my floor. Beautiful colors, very well made, tightly woven and I didn't have to pay more for it than for my dining set. LOVE IT!!! Thanks Overstock also for the three day turnaround, that was a pleasant surprise! Love natural fiber rugs and this one is great in the kitchen. Need a non skid pad underneath. Love the addition of natural texture in the room. Nice quality jute rug. We have many jute rugs in our house as we like to layer them with other natural fiber and antique rugs. We were pleasantly surprised with this one. The thick braiding adds a nice visual texture and the jute itself is a little softer than others that we own. This Havenside Home Duck Reversible Natural Fiber Jute Area Rug - 6' looks great, but doesn't hold up too well for too long. But maybe all Jute rugs are like that? This rug is beautiful and seems to be well made, BUT ... When it arrived, the outer wrap was abraded, although the inside heavy plastic was fully intact. As soon as I opened the inner packaging, I was overwhelmed with a mildew smell, and when I unrolled the rug I noticed gray spots around the center of the rug. In fairness, this is not an Overstock problem, and, despite the scraped up outer wrapping, I don't think UPS had much to do with it either. Having been a truck driver for a number of years, I would have to place the blame on the shipper - the desiccant package was ruptured, the cardboard tube the rug was wrapped around was damp, and the rug got funkier as I got closer to the roll. 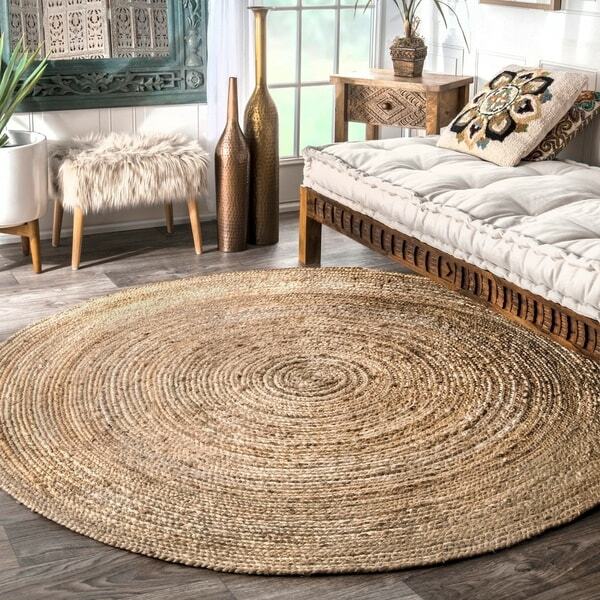 Overall, this is a beautiful rug and matches my jute-rug-on-cork-flooring theme; Overstock is cheerfully replacing the rug, and if it's not rotting when it arrives, I will be an incredibly happy customer. I have purchased thousands of dollars worth of merchandise from this company, and this is the first problem I have had - and it was handled promptly and professionally. Stuff happens, but if you like this rug, go ahead and buy it cuz I'll betcha the shipper doesn't make this mistake again. Too delicate for my family. This rug is so beautiful, I love how the braided jute looks. When we first unwrapped it, it still smelled like fresh grass, which was glorious. However, after only days of laying it out on the floor, the braided edges started coming unraveled and large holes appeared at random places in the rug. I still have it just because a replacement of this size would be so expensive, but it looks like a hungry goat or other such herbivore has been eating at this floor covering. Frowny face emoji, frowny face emoji, frowny face emoji. I purchased the 8' white rug. It does have multi colored natural hues. Which can be clearly seen in the close up pic. When u first unroll it it will have puckering. My suggestion for those who complained is to get on all fours in the middle of rug and gradually smooth it out in all directions starting in the center. This worked for me. If you find the edges curl up on some sides just bend them under the opposite direction and it will become flat. Btw I used mine under my dining table. The rug has nice texture and colors. My only issue is since it is not a thick/sturdy rug it can be pulled out of shape and gets stuck on the coffee table legs. It's pretty. Will need a mattress pad. 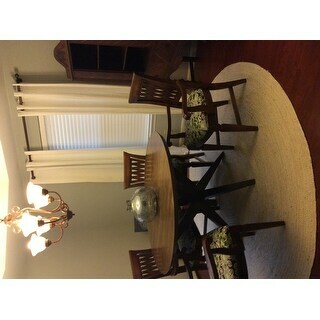 I bought this rug to go under my round dining table. It's the perfect size and color, however, it doesn't lay flat. It kinda looks like a giant sombrero. I'm hoping it will flatten with time. I purchased this for my coastal themed home. Let me say, the color and the feel of this rug are so right on for that look. Fibers are soft and natural in appearance. However, it's poorly made. The braided trim on the perimeter of this piece is fraying and the loose weave in the body comes apart easily with normal foot traffic. At 45 lbs. I can't haul this to return it. If I could, I would. Don't waste your time or money on this one. Great rug - perfect for my kitchen. Just the piece needed to pull it all together. Easy to clean and care for. Love this rug! 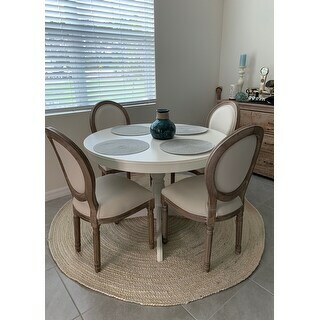 Looks great in my kitchen with my round table. Looking to purchase some runners also in this same braided jute. Perfect rug under the kitchen table. It is sturdy and hides spills well. The concentric circles add interesting texture to the rug. I would have given this rug five stars, but the braiding is coming undone in some places. I bought this in the off-white, it is not true off-white it does have some creamy/natural tones, but it works for me. If you were trying to go for a true off-white, I might look further. The size is good, and so far it has held up well under our kitchen table. No major spills yet though so I speak for staining. We had a small area in our kitchen that needed something and this rug was the perfect fit to that space. We have beach decor in our home, so it was a great addition, and you will love the quality of this rug. It is in a high traffic area and it wears extremely well! Cheap, would not recommend to anyone. Bought an 8 ft dia from Amazon, same brand, and it was well made...and am enjoying it, but the one from overstock is pathetically skimpy. I love this rug, it is exactly what I wanted. It i soft and beautiful, It goes perfect with my coastal decor. I just wish they had wrapped better because it came with few stains. Other than that it is fine. I am planning to order another one. Small threaded knots and relatively thin (exactly what I wanted). No scent and no signs of dirt. "does this rug shed dirt?" "When will the 2.3x4 be available in natural? Is it an oval or rectangle in shape?" This item is oval and comes in different color options. "Is this rug soft? Or rough like most jute. 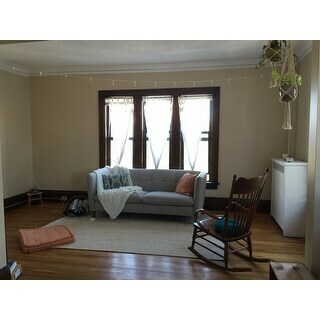 Could it be comfortably sat on in a room where kids might use puzzles/toys/etc?" It's less rough than jute, not as stiff and scratchy but it is thin and would be hard for sitting on. It covers the floor but doesn't cushion it. "Can I have the irobot roomba vacuuming on this rug? Or would that give shed issues? I plan on using in the nursery." "Is the rug easy to vacuum?" "If I need to return it what will be the shipping cost or is that free as well ?"